(left) Our Haptic Revolver device uses a wheel that raises and lowers and spins underneath the fingertip to render various haptic sensations. (center) The haptic wheels are interchangeable and can be customized to render arbitrary textures, shapes, or interactive elements. (right) Wheel features are spatially registered with the virtual environment, so the user can reach out and feel virtual surfaces. We present Haptic Revolver, also known as the Haptic Wheel, a handheld virtual reality controller that renders fingertip haptics when interacting with virtual surfaces. Haptic Revolver’s core haptic element is an actuated wheel that raises and lowers underneath the finger to render contact with a virtual surface. As the user’s finger moves along the surface of an object, the controller spins the wheel to render shear forces and motion under the fingertip. The wheel is interchangeable and can contain physical textures, shapes, edges, or active elements to provide different sensations to the user. Because the controller is spatially tracked, these physical features can be spatially registered with the geometry of the virtual environment and rendered on-demand. We evaluated Haptic Revolver in two studies to understand how wheel speed and direction impact perceived realism. We also report qualitative feedback from users who explored three application scenarios with our controller. 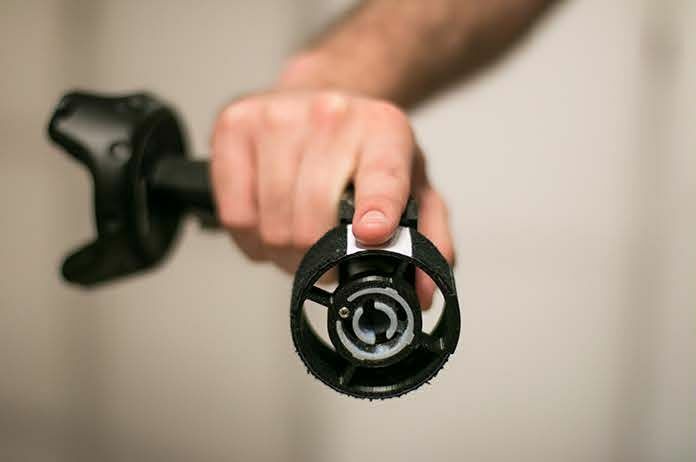 The Haptic Revolver, also known as the Haptic Wheel, uses an actuated wheel that moves up and down to render touch contact with a virtual surface and spins to render shear forces and motion as the user slides along a vir¬tual surface. The controller is designed so that the index finger rests in a groove along the wheel’s axis. When a user touches a virtual surface, the wheel rises to contact the fingertip, its rotation simulating the friction of the fingertip with the virtual surface based on the speed of the hand motion along the surface. The lucky users who got to test the Haptic Revolver reported a convincing haptic sensation corresponding to visual hand motion. Even when they moved their hand freely around a virtual surface while the rendered wheel motion was limited to horizontal direction, users reported the haptic feedback to be quite realistic. The Haptic Revolver was developed by the researchers, working closely with Eric Whitmire, an intern from the University of Washington.